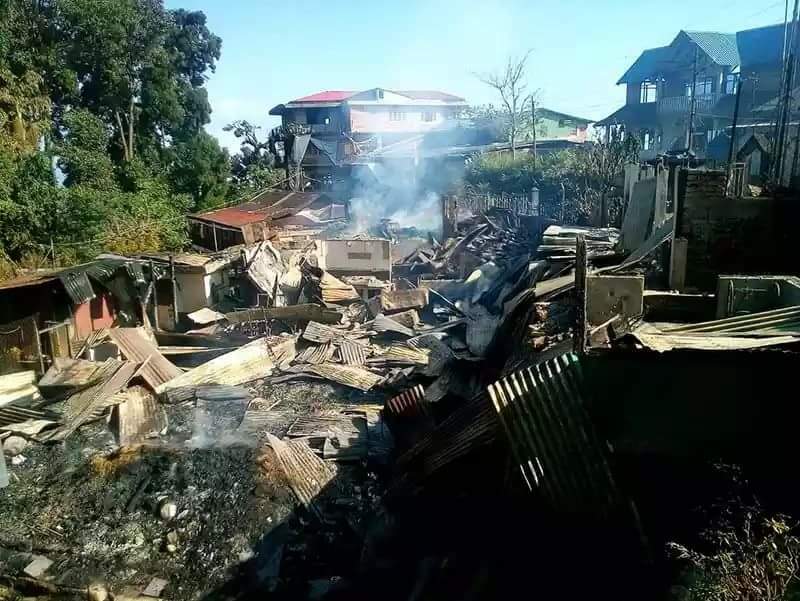 5 houses opposite the Gorkha Janmukti Morcha party office at Patleybash near Darjeeling town were razed to the ground in a devastating fire late in the wee hours of Sunday. While Bimal Gurung supporters have pointed fingers at the police for torching the houses, the police in turn claim that Bimal Gurung's supporters set fire to the houses by themselves to destroy important documents and evidences. A fire broke out in the wee hours of Sunday at Patleybash, 6km from Darjeeling town. The area is a stronghold of the Bimal Gurung faction of the GJM with the GJM party office and Gurung's residence. The houses of Dinesh Theeng, Pravin Subba, Rajesh Tamang, SN Gupta, Prakash Theeng were razed to the ground. Incidentally Dinesh Theeng is a close confidant of Bimal Gurung. He has been implicated in a number of cases including running IED manufacturing units. He is absconding. A local resident requesting anonymity stated "We live in an area located below these houses. At around 11:20pm on Saturday we heard sounds of gunshots. Then we heard of a fire also. We were too scared to come out. Later after midnight when we reached the spot there was a huge fire" stated the lady. The houses were empty at the time of the fire. A ration shop used to be run from the house of SN Gupta. A computer including hard disks were found totally gutted in the fire. Local residents doused the fire. "We live in Darjeeling town and come here just to distribute ration. We arrived today at 3am and the Fire Brigade was behind us. They arrived a few minutes after our arrival" stated 74 year old SN Gupta. The fire brigade engine later left. At around 9:45 am another fire brigade engine arrived to ensure that the fire was completely extinguished. Nothing could be salvaged from the fire. Gurung's supporters claim that the police including Binay Tamang's supporters torched the houses. "The houses have been methodically torched by Gurung's supporters to destroy important documents and evidences against Gurung and his men. This area is Gurung's stronghold" alleged West Bengal Tourism Minister Gautam Deb. Police claim that the owners of the houses were in the knowhow of things and was done to destroy evidence . A forensic team will be visiting the spot later during the day to investigate stated a police official. Gurung's supporters countered stating that though police vehicles were seen crossing the site they did not stop seeing the raging fires. Police were not seen on Sunday morning also in the area. Incidentally the fire comes on the heels of clashes between Gurung supporters and police on Friday in the Singla forest below Lapcheybustee on the riverbed of Chota Rangeet, 20km from Darjeeling town. 26 year old SI Amitava Malik died in an alleged ambush when Gurung supporters opened fire. Gurung and his men allegedly escaped by crossing the mountain river. A large cache of sophisticated arms (AK47, Beretta pistol,) ammunition, detonators, explosives, gelatin sticks, binocular, camping gear, radio man pack were recovered from the camps from where Gurung and his men had hurriedly left following the police raids. Police claim of arresting a Gorkhaland Personnel from the site but have not divulged details for the "sake of investigations." Delhi has been appraised of Friday's incident by the West Bengal Government including the recovery of arms and ammunition and the death of Sub Inspector Amit Malik. West Bengal Government has claimed that this incident is a clear pointer of links between Gurung and North East insurgent groups. The Union Government is seen to harbor a soft corner for Gurung and the GJM, the hill party being an ally of the BJP. This move is being read as a move by the West Bengal to corner Gurung and his men.